Kiley and I needed a good power dinner before we embarked on the MS150 ride this weekend. The MS150 is a massive two day event which consists of either an 110 mile or 80 mile bike ride on Saturday and an 80 mile or 40 mile bike ride on Sunday. I have recently jumped aboard the quinoa train. Toot Tooooot. Get on, it’s fun and tasty. Quinoa is a high-protein grain-like crop which is actually a seed. It is the perfect fuel for endurance events, providing a perfect balance of carbs and protein. It also cooks fast…winner winner. For this healthy pre-cycle dish, I tossed in leftover roasted veggies, leftover chicken, and topped with crumbled goat cheese, basil, and a garlic vinaigrette. If you don’t have quinoa, you can also substitute brown rice, couscous, or even a whole wheat pasta. Roasted Vegetables – Preheat oven to 400F. Cut up veggies in 1/4 inch pieces or slices. Toss in medium bowl. Drizzle with 1 to 2 Tbsp of olive oil. Sprinkle with salt and 1 Tbsp of balsamic vinegar. Scatter the vegetables in a layer on a roasting pan. Roast for approximately 30 minutes or until done. 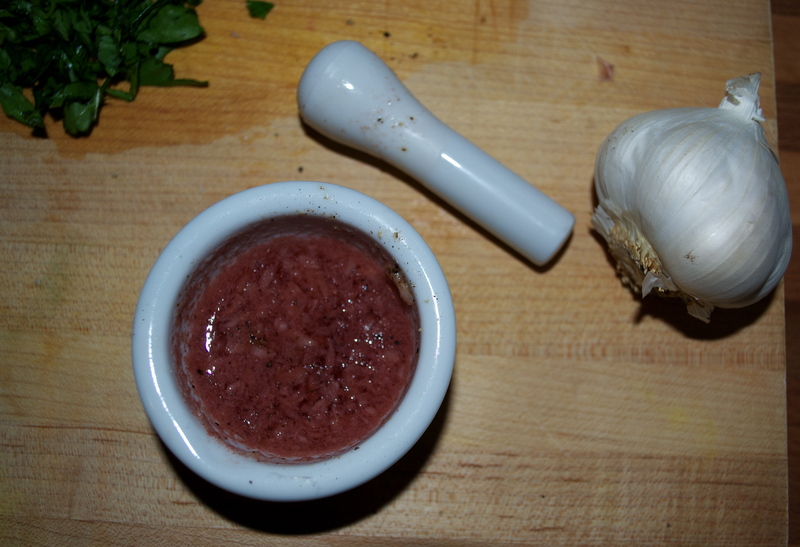 Garlic Vinaigrette – Using a mortar and pestal, pound one small clove of garlic until no chunks remain. Add two good pinches of salt and continue to macerate the garlic and salt. Add the red wine vinegar and fresh cracked pepper. Whisk in the olive pile (2 to 4 Tbsp) depending on the “tartness” that you desire. Taste for a good balance of salt to vinegar to oil. You can also use this vinaigrette on salads too. Quinoa – Rinse the quinoa thoroughly. Place quinoa and water in a medium saucepan over medium-high heat. Bring water to a boil, cover pot and simmer for 20 minutes. 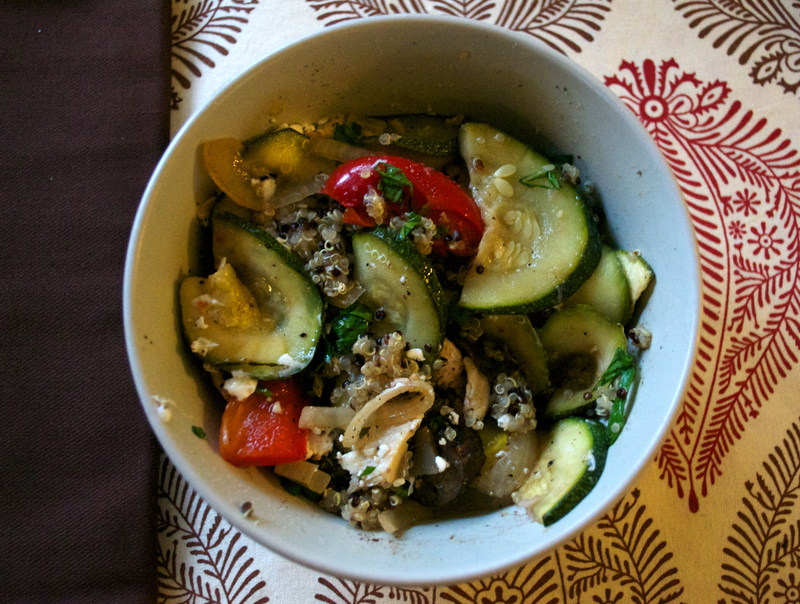 Combine roasted vegetables and quinoa. Drizzle with vinaigrette. I topped mine with slivered fresh basil, roasted chicken, and crumbled goat cheese.